The study in Kings will cover both 1 Kings and 2 Kings. 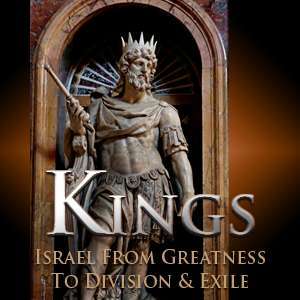 All of the kings of Israel, from the death of David and the reign of Solomon, through the divided Kingdom, to the end of the Southern Kingdom when they went into exile. The purpose of 1 King and 2 Kings is to continue the narrative related to the Davidic kingship and the seed of Abraham where Samuel left off, beginning from the death of David. 1 Samuel covers the transition from the theocracy to the united monarchy and 2 Samuel focuses on the consolidation of the kingdom. 1 Kings begins with the glory and the expansion of the kingdom under Solomon and then its subsequent disintegration and eventual destruction in 2 Kings. It has a historical purpose to trace the line but the most important thing is the theological purpose, that there are lessons to be learned here and the writer is showing how God is faithful to His promise, both in terms of blessing Israel in terms of grace and in terms of judgment. Grace and judgment continue to be themes. It also has a philosophical purpose because it gives us a divine philosophy of history. It is crucial to be able to look at history from the divine viewpoint and not from the viewpoint of economics or politics or race. To view all video Bible studies in the Kings series, click here.